Derek McConnell could be considered to be one Ireland’s most well rounded horsemen. A renowned producer of young horses, Derek has showjumped internationally, winning many competitive Grand Prix and Puissance classes and has also evented internationally to the highest level, winning Dartfield CCI** and being placed in the Eventing World Cup in Ballindenisk being his most notable achievements. From 1988 – 1997 Derek rode for the Irish Army Equitation School before he went on to establish Longfield Farm – a horse production / sales facility located in the sleepy village of Rathangan in Kildare, the Horse Capital of Ireland, which he runs together with his wife, Sharon. Longfield Farm’s facilities includes a large indoor arena with a heated viewing area, accommodation for foreign students, 14 stables , walker and numerous well fenced paddocks. Derek is a HSI Level 2 Coach regularly travels to the USA to teach. He teaches students of all levels here in Ireland and welcomes numerous students from abroad for Instruction at Longfield Farm each year. Derek has produced and qualified numerous horses for the Dublin International Horse Show, including Macushla R, Best Lady, Boodelicious, Longfield Deelight, Longfield Trinity, Longfield Neo, Longfield Di Marco and Hunters Lodge Puissance. 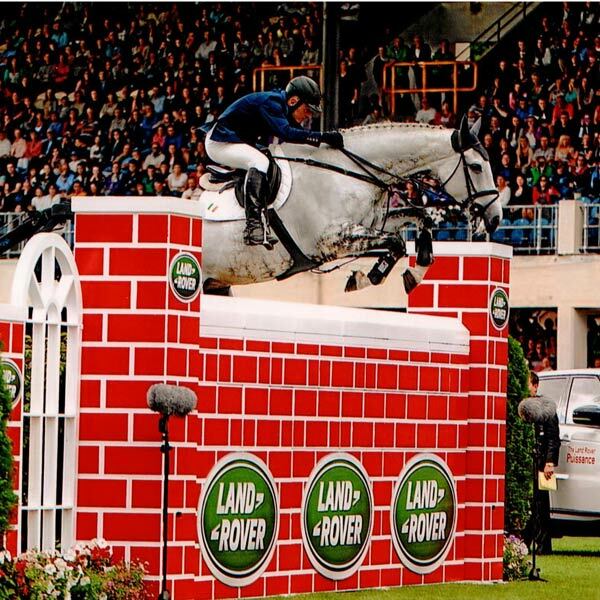 He’s won Puissance Classes at Omagh, Aglish and Mullingar and has been placed in the prestigious Puissance class at the Dublin International Horse Show. Winner of HSI Classes for 5yo , 6yo and 7yo’s, Derek’s a busy man and competes on average in 40 horse shows per year, from young horse classes up to Grand Prix Level. Find out more about Derek on his website – www.longfieldfarm.net.